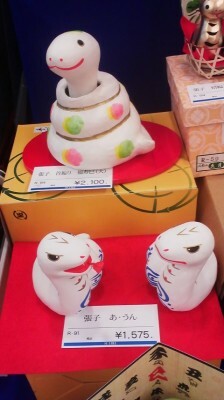 White snake figurines on sale just before onset of The Year of The Snake. 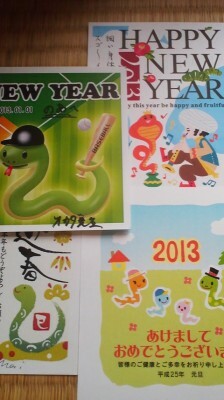 One of the things that the Japanese typically take pleasure in on New Year`s Day (GANTAN, 元旦) is the reading of NENGAJO (年賀状)- New Year`s Greeting Postcards- which arrive on that day bundled up with rubber bands. And this has been going on for a long time. Among the aristocracy the practice of exchanging written greetings at the start of the year goes back at least to the Nara Period (710-794). It was not, however, until the establishment of Japan`s modern postal system in 1872 and the issuing of special New Year`s Postcards (in 1874) that the custom could eventually spread to all levels of society to become one of the countries most universally practiced holiday customs. And the creation of ones own personalized NENGAJO ( and millions of people do design their own) has also grown into a true art form- an annual opportunity for self expression. Like Haiku poems which must be composed using only 17 syllables, origami creations- made from paper without the benefit of scissors (or any cutting), or Kabuki plays- in which all the roles had to be played by older men, the designer of NENGAJO has to work within very tight restrictions- in this case fitting a New Year`s message onto a very limited space ( these cards are all in a set size and quite small)- a challenge which each year leads to some very clever creations. What makes them so interesting and challenging to design is that many (or most) have original picture designs on one side- often unique renditions of the New Year`s Oriental Zodiac animal. Let me a explain a bit about this. For at least 3,000 years, the Chinese have organized the world around using a special system they developed which divided time and space into units of twelve- in the form of an ordered set of symbols which they called the SHI ER CHI (十二支). The earliest extant evidence of the use of this system can be seen in fragments of tortoise shell which were unearthed by archaeologists. These were engraved with characters designating these units, sometime during the Shang Dynasty (1766 BC and 1122 BC) . This year, my five-year old son got his first NENGAJO- from his kindergarten teacher, a few of his classmates, his doctor, and his little-league coach. When his mother handed them to him it was obvious that he couldn`t really undertand what they were. But his expression of puzzlement quickly turned to one of excitement. Suddenly he cried out ROKUROKUBI ! – which is one of Japan`s most famous legendary monsters (he loves monsters! )- a human with an extremely long, winding, snake-like neck. 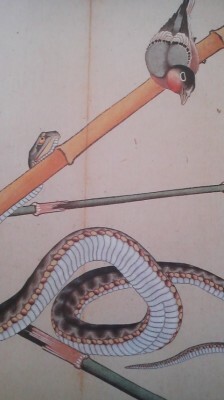 I took the cards from him, just to check, and them corrected him by saying: They`re not ROKUROKUBI, they`re snakes (though I realized later that he might have been on to something about the connection between the two )! I handed them back to him and he perused his cards with satisfaction as he tried to read the messages written on them and slowly came to recognize who each of them was from. Then he asked me: Why so many snakes? I thought about it for a few seconds, and all I could come up with to say to a boy of his age was: Well, because this year is the Year of the Snake. 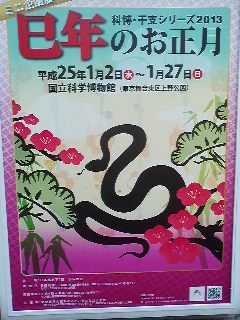 But I continued thinking about his question- and snakes in general – as we left our house and started walking to our local shrine to pay a New Year`s visit- another one of the most popular New Year`s Day activities (called HATSUMODE) in Japan. I laughed to myself thinking about how anyone who was not familiar with the Oriental Zodiac would be just as surprised as my son was to get a greeting card with a picture of a snake on it. I mean, in most parts of the world (including contemporary Japan) snakes are considered sneaky, creepy, slimy, scary, even EVIL creatures. This is easilly understandable since snakes move silently along- without legs- have a strange forked tongue, and in the case of some species- can kill a human with a single bite. Not at all a creature that would seem appropriate for a friendly offering of good wishes! In fact this image of the EVIL SNAKE can be seen as having been taken to extremes in the bible. According to the book of Genesis, Adam and Eve, the original human couple, were living happilly in Paradise. There was no need to work (or wear any clothes) and life was eternal. There was one condition, however, put on this ideal arrangement by God- they were not allowed to eat fruit from the Tree of Knowledge. Enter the crafty snake (who at that time, according to Genesis, still had its legs). With its smooth talking and wily ways it got Eve to eat of the forbidden fruit and then tempt Adam to do the same. And what did the snake`s actions bring about according to this story? Nothing short of the fall from paradise, human mortality(as well as morality and intelligence), the need for man to labor for his bread and for a woman to suffer labor pains during childbirth- and lets no forget the fact that snakes themselves lost their legs and had to eat the dust of the earth forever. 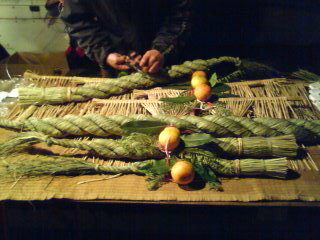 Straw snake wrapped around the torri gate at a shrine near my house- not just for the Year of the Snake- but ALWAYS! 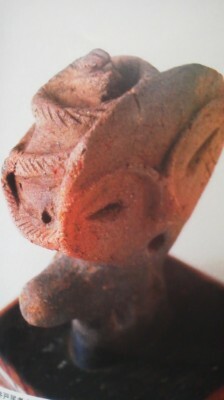 It signifies prayers for rain, good harvests, and symbolizes fertility,rejuvination, even- immortality! When we reached our local shrine I could see (and photograph) evidence of how here in Japan, as well, the snake could be considered the most important animal from a religious point of view ( though most Japanese today are not aware of the fact). 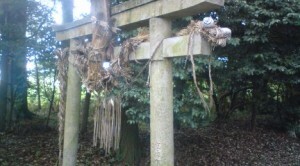 You see, at the entrance to the shrine, which some say is the oldest in this area ( more than 1,300 years old) we came face to face with a large straw snake which is wrapped around the Torii Gate at it entrance ( these are symbolic entrances to the shrines sacred space- always open to the public). 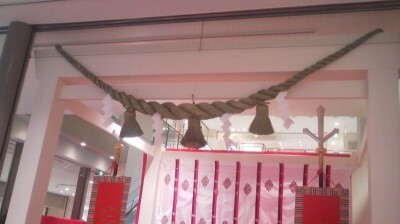 And no, it was not put up there for the Year of the Snake- this snake is always there. Why would that be. Well, the Japanese (as well as the Chinese) have long associated snakes with water. This is because in Japan snakes are in fact often seen in or around streams, lakes, ponds, and especially paddy fields ( there are some species which even live in the sea). In the past when flooding was common in Japan (including Ibaraki-especially the Tsuchiura area), it was not unusual to find that snakes would be trying to take refuge on the same roof top or the same tree that you had climbed up on. Thus people associated snakes with flooding and water. ( One of my most shocking experiences in Japan was once when I had gotten undressed and was just about to slip into the bath when I notice that two baby snakes were swimming around in the tub! They had gotten in there through the hole where the old water heating system used to be- so for long I too, have associated snakes with water!). So it would seem only natural that a snake should be hanging around the torii gate at the O-Washi Shrine Shrine near my house in Tsukuba. You see this was historically one of the driest and most difficult to cultivate parts of what is now Tsukuba City and they certainly did want to pray for water. 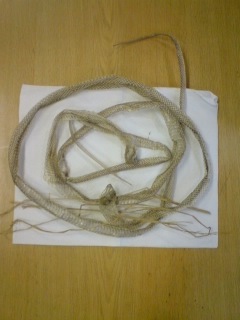 A molted snake skin about 2 meters long which I found INSIDE my old house in Konda, Tsukuba. Many Japanese put such a snake skin in their wallet or keep it in a box or hang it from the rafters- for good luck- especially the financial kind! 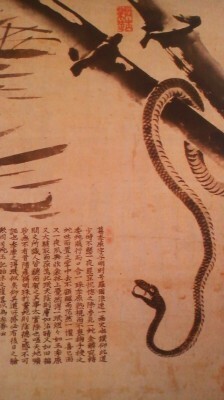 For the ancient Japanese, who saw REAL MEANING in shapes, sounds, similarities, and actions, the snake was a very significant creature indeed. 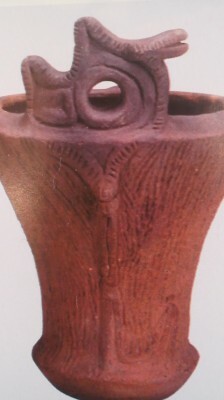 It ate mice (and thus protected crops) and even in Japan`s pre-agricultural past snake motifs were used as a symbolic protection fron pests (see Jomon Period pot, below). The fact tha snakes MOLTED (shed their skins and bore new ones) was also an amazing phnomenon for the ancients and they so this as a sign of continual rebirth- and even eternal life. 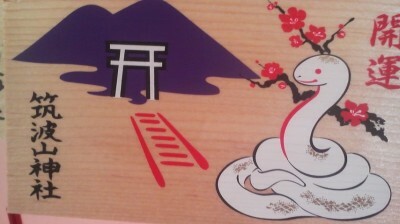 Because of this and the fact that according to traditional Chinese thought (which strongly has affected Japan culture) snakes- especially white ones, are connected with METAL and thus coins and money. This is why even today it is not so unusual for a Japanese person who finds a molted snake skin to stick it in their wallet- keep it in a nice box- or even hang it from the rafters! 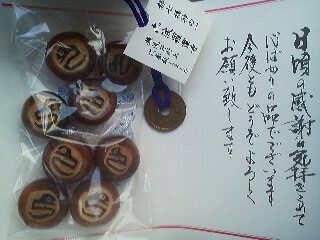 This is believed to be good for monetary good luck. And in the wallet it represents the notion that what you have spent will come back in greater amounts! 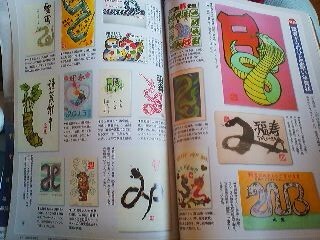 (this concept is also important at most BENZAITEN or BENTEN Shrines in Japan- at which snakes are the messenger of the deity. 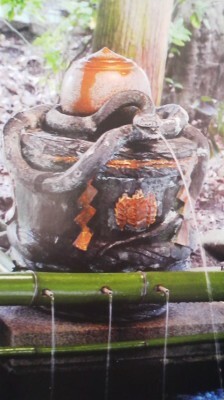 It is common to pray for your money to increase, sometimes by washing the money (snakes and Benten are connected with water) as is the case at the famous ZENI ARAI BENTEN in Kamakura. 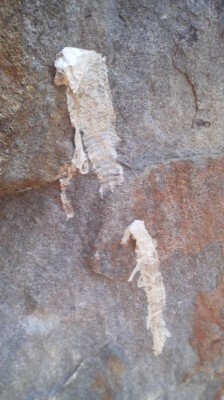 Once in my old house in Konda, Tsukuba- the same one with the baby snakes in the bathtub- I found a shedded snake skin INSIDE THE HOUSE! 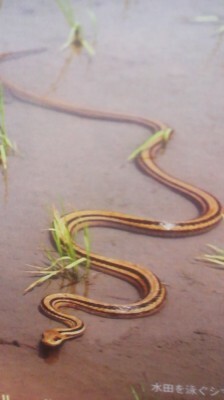 It was almost two meters long! (See photo below) As you can imagine, I put it in a box for safe keeping though it certainly did not help increase my finances! Some more characteristics of snakes which bear symbolic significance are that when they swallow large prey they look PREGNANT, and maybe most importantly ( and universally recognized) is their phallic appearance- which is probably also why the snake was used in the story of the TEMPTING of EVE. One of The Original Objects of Worship in Japan? So now you can understand even more easilly why a snake would be wrapped around the gate of a shrine whose main purpose was to pray for sufficient rainfall and for good harvests. 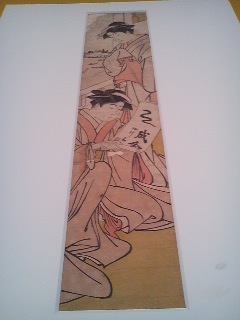 But I would now like to suggest, that in ancient times the snake was of much greater religious significance in Japan. It just might be that snakes were the original major object of worship in the Japanese archipelago. 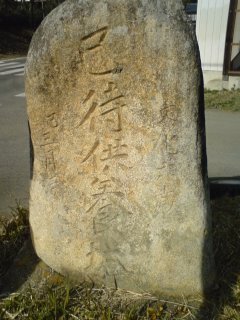 In the ancient chronicles of this part of Japan ( what is now Ibaraki Prefecture)- the Hitachi no Kuni no Fudoki (常陸の国の風土記) there is a story about the original development of the area for rice cultivation. The 8th century text goes on to describe how a giant snake (flooding?) was impeding development. When the snake was eliminated ( water problems solved by the application of civil engineering techniques?) the snake became the object of worship so that its spirit would be appeased and cause no harm out of vengeance. It was then decided to cordon off the mountain areas as the sacred realm of the deity, and reserve the lowlands for human activites and agriculture. The very interesting feature of this story is the fact that in the text the characters used to wrote the word snake are 大蛇　which means large snake and is usually read as DAIJA. In this story however, the characters for BIG and SNAKE together are read as O-Kami which is the common Japanese word for deity or god! In this part of Japan- even in this day and age- it is usual out in the countryside to let snakes, even very long ones, live in the garden or under the house. These are called the Masters of the House. Some specialist of Japanese religion go as far as to say that the Japanese word for deity- KAMI – derives from the old way of saying snake: HEMI. 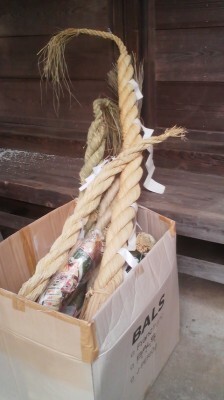 It is very probable that the ALL the sacred ropes (SHIMENAWA) used to deliminate sacred space (and not only the rope at the O-Washi Jinja Shrine near my house) were originally snakes.It is interesting to note in relation to this that snakes in many parts of Japan were also called KUCHINAWA (ropes with mouths). In this part of Japan (Ibaraki)- even in this day and age- it is usual out in the countryside to let snakes, even very long ones, live in the garden or under the house. These are called the Masters of the House (IE NO NUSHI- 家の主). 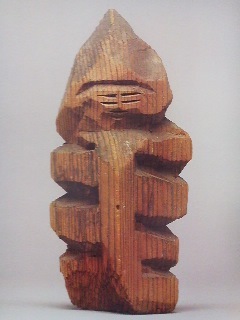 There are MANY legends from just about every corner of the Japanese Archipelago which connect snakes and water, snakes and rain, snakes and stones, snakes and mysterious pregancy, etc. Over the coming year I will post translations of some of these- especially those which are told in the Tsukuba area and the surrounding region. 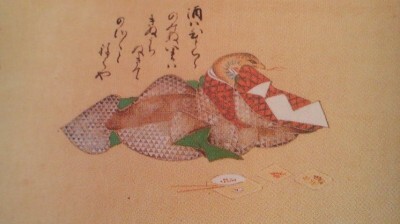 Snake Motif (1766) painted by Katsujakyoku (葛蛇玉) who actually incorporated the characters for SMALL BALL　(蛇玉) into his name after he dreamed of a snake presenting him with a magic ball. The fact that snakes filled the ancients with a sense of mystery and awe can explain how snakes became culturally important not only in Japan but in India, as well- where some of the world`s most dangerous snakes live. 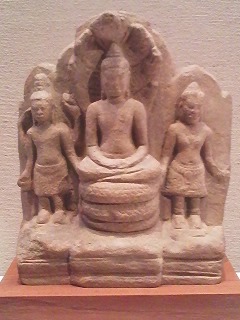 This could explain why the snake plays an important role in Buddhist iconography – as you can see from the photos below, even the halo around the Buddha`s head seems to have originally evolved out of a group of cobras with open hoods. As I have mentioned above, one of the important places to see snake motifs in Japan is at shrines dedicated to the Goddess of Good Fortune BENZAITEN ( the Japanese incarnation of the Hindu Goddess Sarasvati). 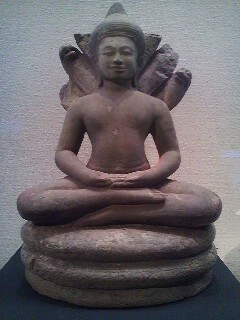 In India this deity was a ssociated with rivers, music, talking…… anything that flowed. 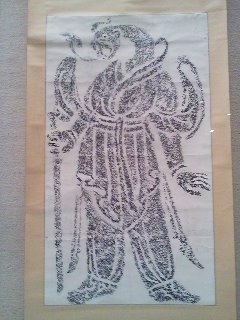 In Japan, as well as her continued connection with water and the arts, she became a protector of the state and of Buddhism itself (the she is both a Buddhist and Shinto deity in Japan). 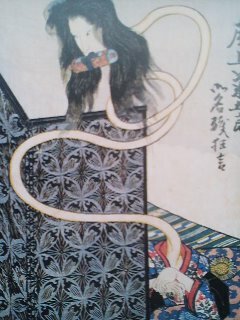 Since she was a water deity she has always been connected with snakes and dragons, but probably becaue of hte connection to the snake and the Chinese connection between snakes and money, certain Benzaiten Shrines became famous as places to pray for wealth. In fact, it went so far as having the way the Goddesss name was written changed to include a character which means wealth (ZAI-財). Whenever you see a small shrine by ( or in) a pond, you can almost be sure that it is dedicated to Benzaiten (who can also be called BENTEN-SAMA). 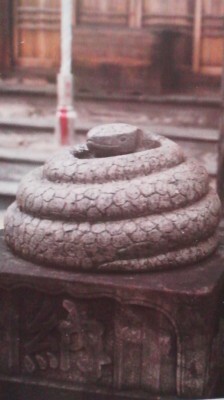 Sometimes at these shrines you can find a stone carvings of UGAJIN a deity which has the body of a coiled snake and the head of an old man (or young woman). Offerings to these shrines or annual festival almost always take place on a Day of the Snake- often the first one of the year. Now one thing that you might be wondering about, especially if you have read my article about last year`s zodiac animal- the DRAGON- is what is the difference between the two in terms of their symbolism, since both are strongly connected with water, rain and the Goddess Benzaiten. Well the main difference would be that the dragon is strongly associated with fire prevention or putting out fires – while the snake is more strongly associated with agriculture. And also, while the dragon can soar into the sky ( past generations saw tornados as dragons), the snake, with neither wings nor legs is completely earth (or water) bound- making the connection to agriculture and fertility even stronger. Snakes can be found inhabiting all the continents of the world (with the exception of Antarctica), and there are about 2,500 species. 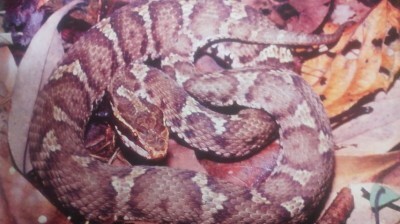 Not only are they distributed widely on a global scale, but they also occupy an amazingly wide variety of habitats: the sea, the jungle, the desert, the plains, the mountains (the highest living species can be found up 4,000 meters above sea level), underground, or up in the tree tops- snakes have even been found to inhabit the southern limits of the Arctic Circle! And since they are all reptiles and cannot control their body temperatures, the snakes that live in regions which get cold (like Japan) have to hibernate- many by spending the winter underground or in some other snuggly shelter that they might find. It is also quite interesting that while some snakes lay eggs (which they do not sit on as birds do), many species, such as the Japanese viper (MAMUSHI) are ovoviparous (卵胎生)- which means that their eggs are kept and then hatch INSIDE the mother`s body, and thus LIVE snake are born.
. The MAMUSHI is still abundant within the Tsukuba city limits and the surrounding area. Farmers often warm me about them when they see me headed into THE BUSH as I search for plants, birds, or sacred stones, but in truth I have never seen a live one. The mamushi can be recognized by its triangular head. They are not very aggressive, however, and are apparently quite slow moving. They are also nocturnal, which makes a dangerous encounter with one less likely. The most dangerous scenario would be if while hiking you decided to have a rest a on a rock or in a nook where a mamushi happened to be sunning. And though its poison IS dangerous I have never heard of a case of death by mamushi or yamakagashi bite in this area ( I have checked with the local health office and found out that the emergency rooms all keep a stock of anti-venom). On a nationawide scale, however, between one and two thousand people are bitten by MAMUSHI each year and among these about ten (mostly elderly) die. On the other hand, many mamushi are cruelly killed by people in the countryside in order to make a tonic called MAMUSHI SAKE. 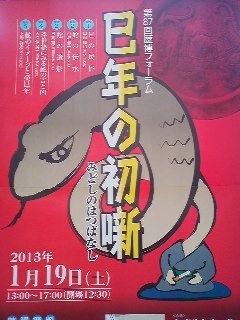 The snakes are caught and then put live into a bottle paritally filled with drinking alcohol (SHOCHU). The bottle is then sealed and the snakes left inside. It takes many weeks for them to finally die. And the snakes are left inside the bottle until the whole batch has been drunk up. For those intersting in Japanese culture and nature, however, the most important snake ( in my opinion) must certainly be the AODAISHO (Japanese rat snake)- which as I have mentioned above has traditionally been referred to as IE NO NUSHI (家の主)- the Master of the House. This snake has usually been left to go about its business of CATCHING MICE and RATS. Since it is not poisonous and protects the farmers precious crops and cupboards from pests it became a natural human ally ( though now chicken farmers certainly do not want these snakes around either). One of the most interesting re-occurring wildlife experiences I have had in Japan has been watching the 2 meter long aodaisho that lives in my garden defend itself from my dog- who was very sensitive to the presence of snakes. If she cornered the big-old aodaisho in the yard, the snake who form a long arc with its body- something like a big letter C. Then, while keeping its head perfectly still, its would wiggle the tip of its tail. My dog, though quite intelligent for a pooch, stayed focused on the quivering tail. If she appoached the tail, the snake was prepared to strike with a bite from behind. Luckilly my dog was instinctively very scared of snakes, and though while she barked, jumped around and struck a series of generally threatening poses, she never went as far as actually trying to bite the snake. If she had done so- she would have gotten a nasty bite for the aodaisho. 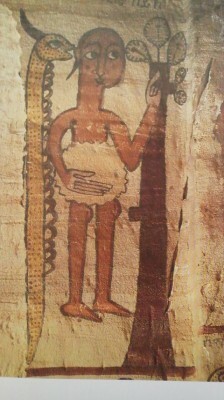 Detail from a mural in an ancient church in Ethiopia showing Eve being tempted by the snake ( who still has his legs! To be continued………….. this is a very deep subject and I will continue to add to it over the next few days- please keep checking! Amazing Turn-Around ! Moxibustion Gets Fetus to Move Out Of The Breech Position and Thus, C-Section is Avoided! Splendid article about HEBI!! I don’t like snakes. But I once have tasted grilled Mamushi in a special restaurant in Hiroshima, taste was not so bad!? Anyway I checked number of Japanese songs about snakes. There are 77 songs! !, so many! Pity I never heard all of them. Can I win lot if I try to remember and sing a few of them?